If you are a new grandparent keen to help fund your grandchild/ren’s future higher education, please proceed with caution when it comes to choosing the actual investments. I was out with a friend for dinner a few weeks ago and she was telling me how 20 years earlier, her in-laws had kindly set aside $10,000 for each grandchild’s post-secondary education. She went on to tell me that for the eldest grandchild in the family, that initial $10,000 was now worth…$8000. “I’ll say,” I replied and then promptly pulled out my iPhone, right there in the restaurant, and proceeding to the nearest on-line compound interest calculator. I punched in a few numbers then looked at my friend. “I have a feeling I don’t want to know,” she said. Versus $8,000: when it comes to paying for a University education, $19,000 is a good chunk of change. So the moral of the story is: if you are in a position where you can put aside some funds to help with your grandkids’ education, wonderful! But when it comes to choosing the actual investments, proceed with prudence…for your decisions today could make a huge difference in a child’s life 20 years from now. 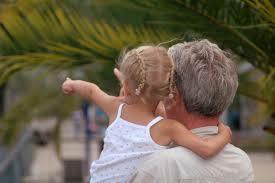 Now, of course, there is also the option of contributing to a grandchild’s RESP or going the route of setting up a trust. But for advice on these, there is an outstanding article in the Sept 2015 issue of Canadian Money Saver magazine (in the “Ask the Expert” section).